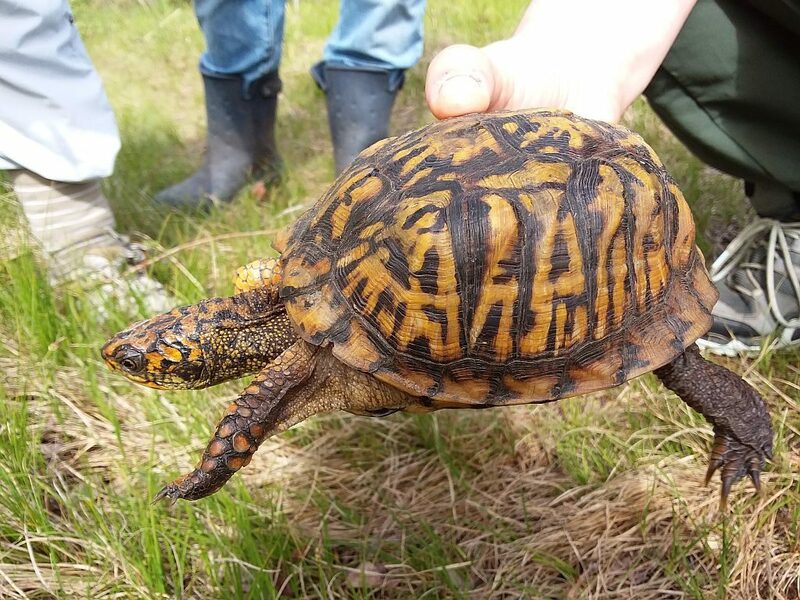 This post was contributed by volunteer Tim O’Brien who’s currently doing a study of eastern box turtles and works to conserve other threatened and endangered turtles. 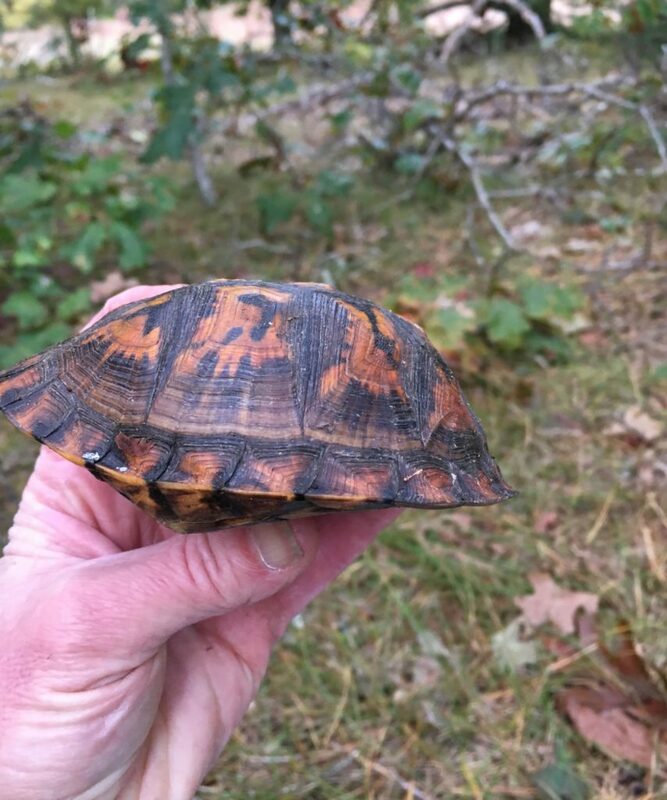 In 2018 we instituted a non-permanent paint dot marking system for the sanctuary’s eastern box turtles. Here’s why. There’s anecdotal evidence suggesting that repeated handling of box turtles over time can soften their predator response mechanism. I see this in some of our older resident turtles who have been exposed to decades of day campers and public programs. This could be an issue if a turtle encounters a predator and does not fully and quickly withdraw into its shell. Unlike most turtles, a box turtle can pull its head and appendages fully into its shell. A hinge in its bottom shell folds up to close off the front, practically sealing the animal in a perfect box. Predators apparently get tired of waiting for a turtle to emerge and abandon it. Each year we try to process (measure and weigh) every box turtle on the sanctuary at the beginning of the season and again at the end of the season. Often, turtles are captured and processed by interns and volunteers who may not know that the turtle has already been worked up and entered into the data base in a given year. Some turtles are inadvertently processed many times in a year, sometimes even on the same day! It can be stressful to them. To help alleviate this problem, we instituted a paint dot system this year to minimize handling of turtles. 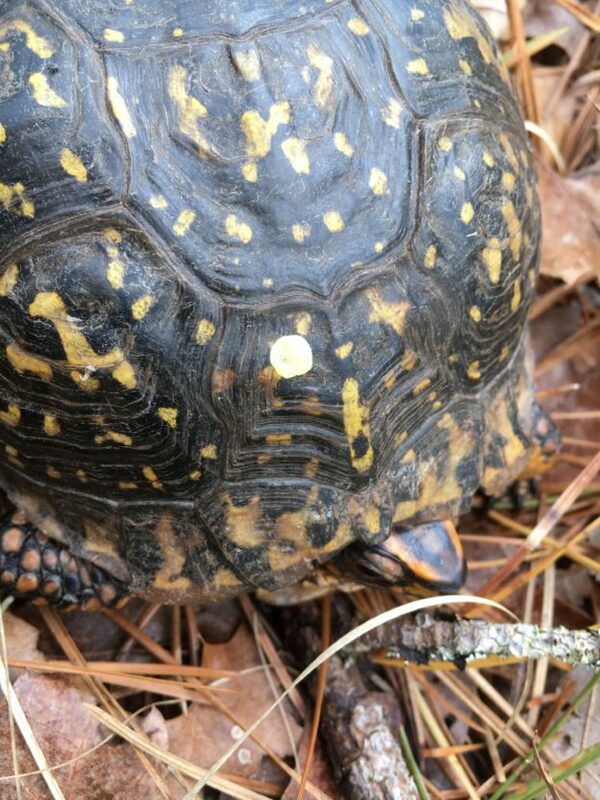 Most of our box turtles are permanently identified using a variation of the Cagle marking system (making tiny notches in the marginal scutes with with a small file). This allows us to uniquely identify the turtle for life. But what we needed was a short term way to determine whether or not a turtle had been processed in a given year. So now in addition to reading the permanent scute notches, we put a small dot of non-toxic, water-based paint on a vertebral scute that corresponds to the month the turtle was processed. Each of the five vertebral scutes correlates to a month (May – Sept). Turtles can be active for more months than it has vertebral scutes. 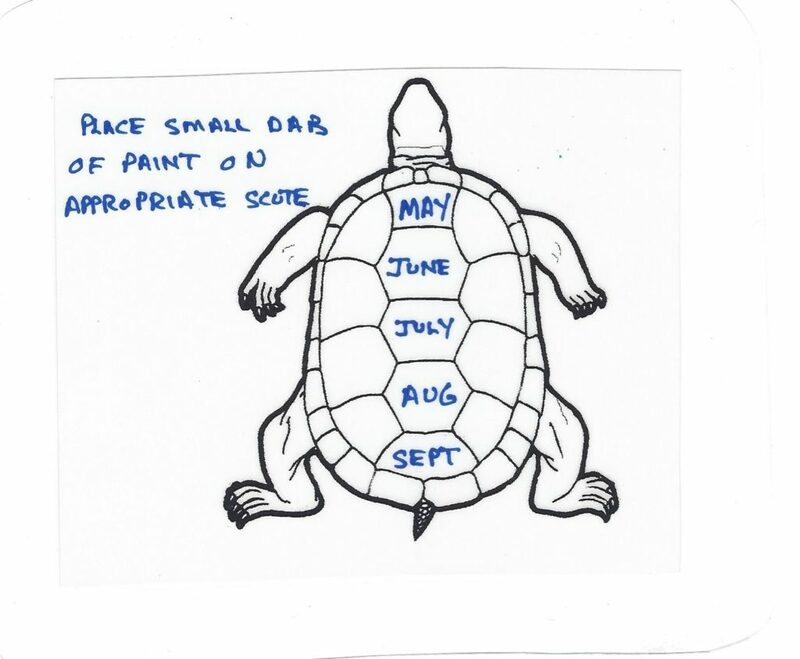 So if a turtle is found in April, the paint dot would still go on the first scute for May. Same thing for a turtle found in October; the dot would share the September scute. (Drawing by Tim O’Brien). The color of the paint denotes the year and we will change the color every year. We use paint colors with earth tones to somewhat blend in with the turtles natural carapace colors. For example, V2 (the second vertebral scute) corresponds to the month of June and yellow was the paint color for 2018. So a small paint dot on V2 indicates that the turtle has had its initial processing of 2018 in June and there is no need to handle this turtle again until the fall. The paint dots seem to last the season, but can easily be scratched off for next year. We used this system all season in 2018 and it seemed to work fine. Can you tell when this turtle was last handled? Hint: the turtle is facing us. (Photo by Tim O’Brien). We hope that using this new system will prevent over-handling of our resident box turtles so they can live comfortably and be as safe from predators as possible! A box turtle demonstrates the predator response for which it got its name. (Photo by Tim O’Brien). This entry was posted in Updates on March 17, 2019 by Wellfleet Bay. Tim, it’s so great to read about your research! So interesting!